Marina's Kitchen Table: Paper or...Electronic?? I was thinking the other day of the time I did childcare in our home - 2 little sisters of dear friends...as close as family that friends could get. 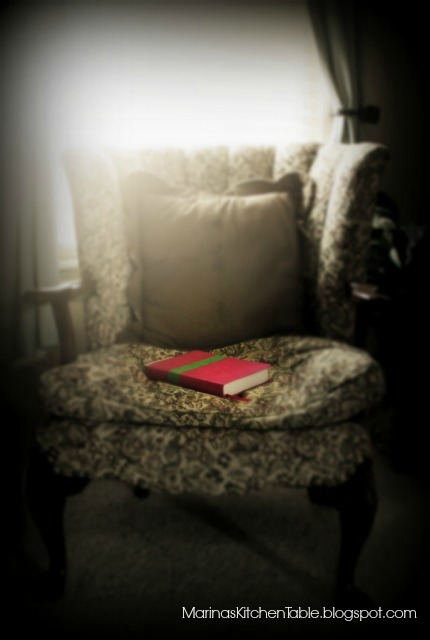 Each day, one of the little girls would see me sitting in "my chair" and reading my Bible. Some days she'd toddle up to me and climb in my lap as I'd read that day's Proverb, or whatever else was on my reading schedule for the day (or as God led me to read). It was clear, even from a distance, what I was doing. 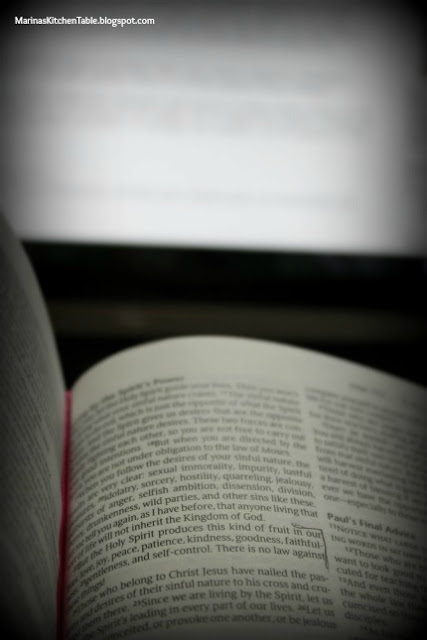 But now I've gotten into the habit of reading my devotions, Bible studies and even Bible off of whatever electronic device is handy...usually my phone, sometimes an e-reader or my laptop. No one can tell if I'm deep in spiritual thought or playing Words With Friends! It didn't really impact me until my grandkids were around me, and I wondered what did THEY think I was doing. SO, I've made a point to go back to my paper Bible as much as possible. I want to leave a legacy of Bible Readers, and I want that visual to be told over and over again; remembering Grandma Marina sitting in "her chair" and reading her Bible...not always on her computer (because I spend a lot of time on that anyways), but reading God's Words. Of course, more than the memory of me reading my Bible, I want them to see actions and words that are evident of the Fruits of the Spirit in my life; Fruits that are nurtured when I spend time in God's Word, and in prayerful conversation with Him. There's no other way to get that. 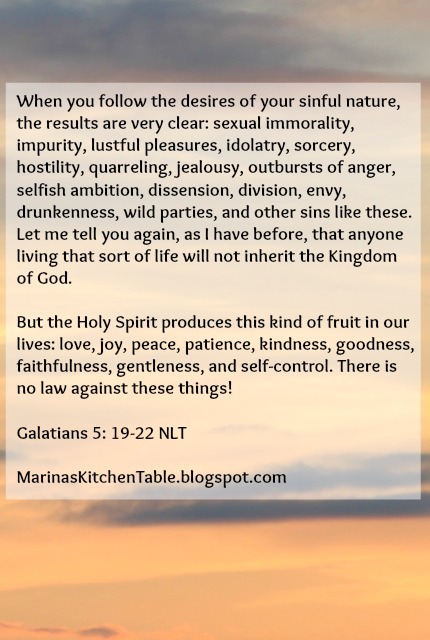 No way of faking God's Fruit! So I challenge you, put down the (enter your favorite electronic device here) and find that paper Bible, dust it off, and put it next to your favorite chair. Whether morning or evening, if there's a child in the house, I think you'll find they enjoy climbing on your lap and reading along with you... and if there's not a child in your house, then enjoy a special time alone with God, to enjoy His peace in solitude. I have recently realized the same thing. I bought a new bible (pink leather cover ;) for my #hellomornings study. At work, I always use a Bible 'book' for whatever I'm doing there. I have bibles throughout the house. However, I use my iPhone at worship. Mostly because I work at the church on Sundays and have my hands full! Thanks for your comment! I think we might have the same Bible...mine's the one in the photo; pink with the green stripe on it. Just another thing we might (almost) have in common!! Well said! I agree completely. Aren't children and grandchildren wonderful reminders of God's desire for us to walk in His way and receive His blessings? I love His promise to be faithful to all generations. I count on that as I pray for my family and those I love.